Most web design firms glaze over when you bring up the idea of ADA compliant websites. I have to admit the first time I heard this, I was confused about what this meant. It seemed like something that was not even possible. I had a lot of questions like who was the enforcement agency and who sets these standards. I realized many of the standards also affected the design quality of websites. How does one even navigate making a website ADA compliant? The American Disabilities Act was enacted in 1990 to address building accessibility. It did not include language specific to website accessibility. It was not until 2010 that the issue of websites were addressed. In 2010, the US Department of Justice issued a proposal to amend Title 3 of the ADA to include website accessibility. Since this date, there have been numerous ADA website compliant lawsuits. These have targeted large corporations including Target, Reebok, and even the NBA. Who Enforces ADA Website Compliancy? The Department of Justice (DOJ) is the enforcement group for private commercial websites. The Department of Justice (DOJ), has made it clear that it interprets the ADA as applicable to websites. 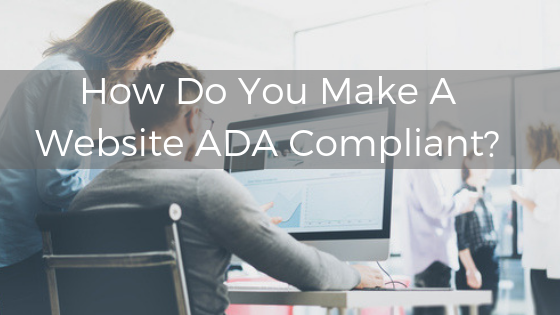 What Are ADA Website Compliancy Standards? The organization known as WCAG has issued standard checklists known as 2.0 and 2.1 versions. These compliancy levels are separated into three levels A, AA, and AAA. We will address the detail of the standards within this article. Here at Glacial, we made the decision to provide ADA compliant websites for our base of practices. Learning how to do this was not an easy task and spanned the course of an entire year of research and training. We started by interviewing companies who were completely dedicated to this topic. They only build compliance plans, and for thousands of dollars. At first, it seemed confusing how a small medical practice could afford full compliance. After a lot of research, we were able to use the WCAG resource. We got a list with the different functionalities and the levels of compliance. We recently received a client letter stating the importance of an ADA compliant website. Understandably, he was alarmed that his site was not compliant. He is not alone and there are many practices who are not even close to being compliant! Many people assume that their websites are built to be ADA compliant but the harsh reality is they aren’t. If you are researching the process of making your website compliant, we would like to suggest a few steps. When we first started telling clients about this, most of them did not care. Many did not want to incur expenses to complete the items required. We completely understood this reaction! After all, it can seem like just one more website cost to pay for. Most firms will give their clients the options to make their websites ADA compliant. The option is there but it is not mandatory. Once you have determined the value of making your site ADA compliant, you’ll have to know the cost. It’s important to do some research since the numbers vary! From our own research, most of these compliancy tasks are overpriced and not worth it. At the end of the day, it comes down to hours and time spent. Interpreting a certain set of criteria and what it means to be truly compliant can often be an opinion. At the very least, most businesses should make a basic attempt to get a majority of the retrofit items into play. If you want to avoid problems later on, it is worth it to be proactive and plan ahead. As a medical marketing agency, there is no way around saying anything else. Like making physical buildings ADA compliant, we must do the same thing on websites. There is a cost when you’re making buildings wheelchair accessible. That cost is time and labor. It’s the same issue when completing the tasks for ADA compliancy on a website. The difficult part of pricing an ADA compliance retrofit is that it depends on page volume. The more pages a site has, then the longer it will take. What happens if I get a letter from a lawyer? The lawyer will be instrumental in crafting a response. Most of the clients who have come to us for help had scenarios that amounted to nothing more than someone trying to get cash out of them. It is unfortunate that this happens but you can take some steps to prevent this from happening. Find this happening to you? Check out this link from a lawyer who tried to bully a pratice. Add dir=”ltr” to html element. Just because you have an ADA compliancy retrofit does not mean that you can set it and forget it. We encourage both web design firms and practices to stay up-to-date on compliance standards post-launch. You never know when a new feature will come out that could make the website more compliant or easier to browse for users! We find it useful to have ADA web compliancy statement. This website aims to meet the compliancy standards of the Americans with Disabilities Act (ADA) by utilizing the WCAG 2.1 guidelines. WCAG 2.1 are stable, referencing technical standards presented to meet the ADA. The Americans with Disabilities Act (ADA) of 1990 is a civil rights law that mandates the elimination of discrimination against persons with a qualifying disability. If your practice has a website, you are obligated to comply with the ADA. This is regardless of the size of the practice or the number of employees. In particular, Title II of the ADA refers to websites and protects the freedoms of the visually impaired. This also protects those that are hearing impaired. Any disability should not prevent someone from being able to access information on the internet. If you do enough research, you will find a lot of information about what it takes to make your site compliant. If you are using a screen reader and are having problems using this website, please call us! Not sure where to start when it comes to making sure your practice’s site is compliant? Fill out the form below to contact us!